The classic 27.61 metre sailing yacht Letizia, listed for sale by Northrop & Johnson, has been sold in an in-house deal. She has an open floor plan where the main saloon, library and galley effortlessly flow to create a space ideal for socialising or relaxing. The saloon features a formal dining area on the port side with a large U-shaped sofa, perfect for lounging. To starboard there is a breakfast bar facing the galley forward, plus an entertainment centre and two plush leather occasional chairs, allowing everyone a place to retreat. Further aft the helm cockpit offers more seating and both cockpits have optional shades that can be erected if required. 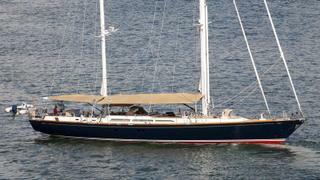 She has wide decks so that, when not under sail, the foredeck is perfect for sunning or simply relaxing. Under power, a single 280hp MTU diesel engine gives her a cruising speed of eight knots.